It’s essentially a watered-down version of Mario Kart without the turtles. 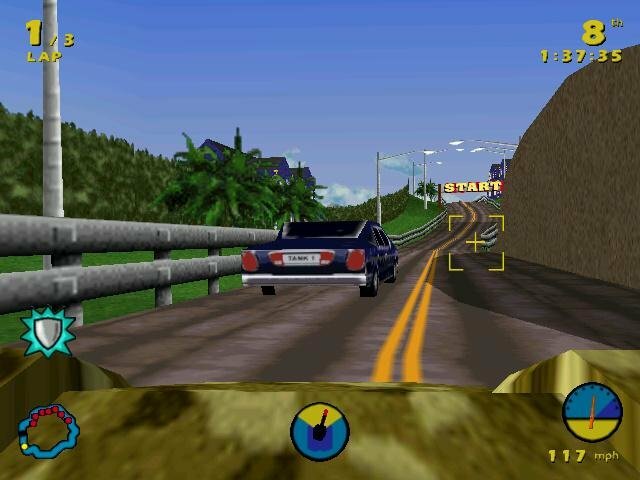 The graphics have some cartoony appeal, but the track layout is blatantly oversimplified. 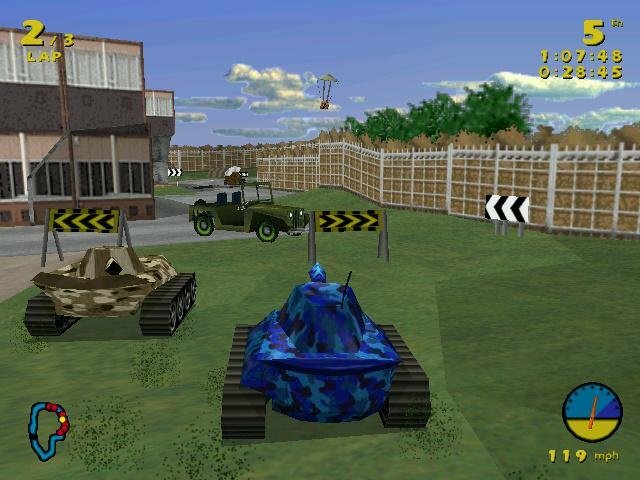 If you’re developing a game about tanks, nay – tank racing, you’d at least have the common sense to add some real tanks. 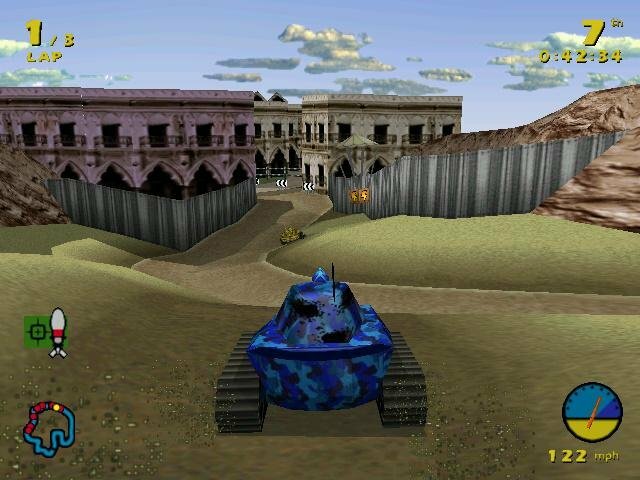 Even in a setting as arcade as this you can still picture the fun of having to drive a Soviet T-34 alongside a German Panther, exchanging shells as they race towards the finish line. 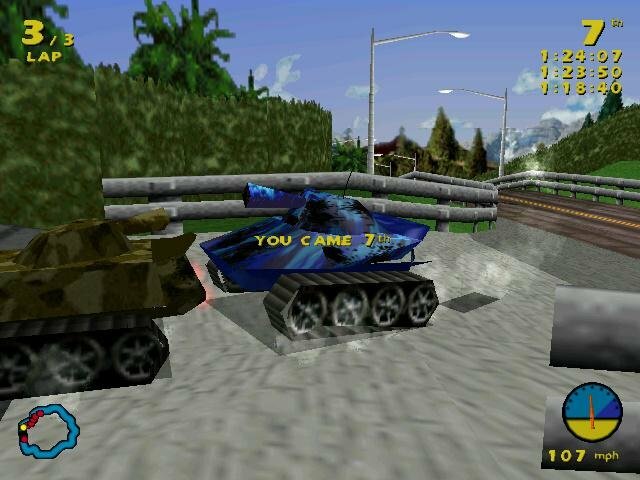 Or maybe go nuts with an ultra-light T-26 on some of the more narrow tracks while driving a heavyweight Tiger on the wider ones, easily crushing obstacles and your lighter opponents. 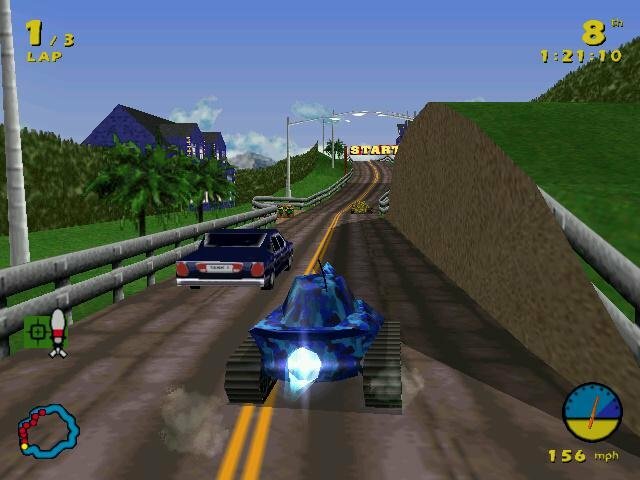 You can imagine doing a lot of fun things in a tank racer, if anything because it’s an unexplored venue of racing, but don’t dream of finding any of the good stuff in this game. 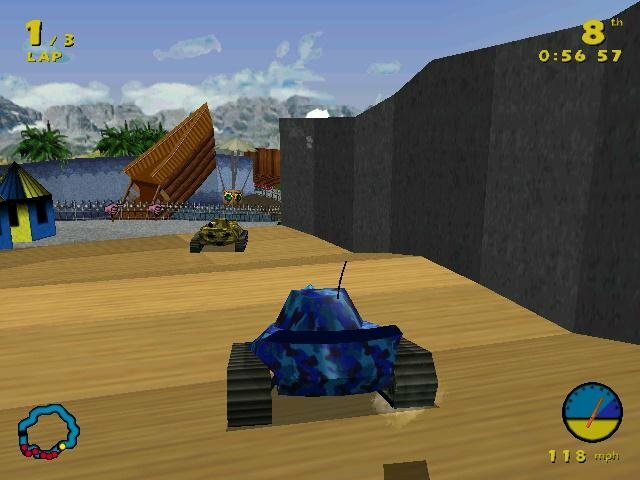 Tank Racer is instead an unassuming Mario Kart ripoff, minus the turtles and most of the fun. 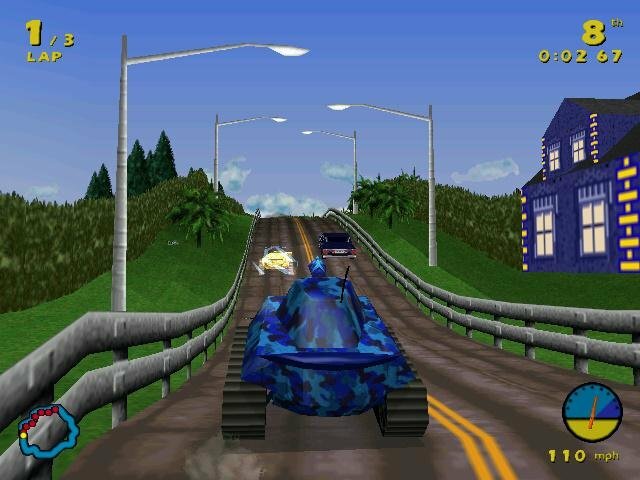 You have the option of driving one of several tanks through such cartoony recesses as the beach, a dark swamp, Mexican border town or a theme park. 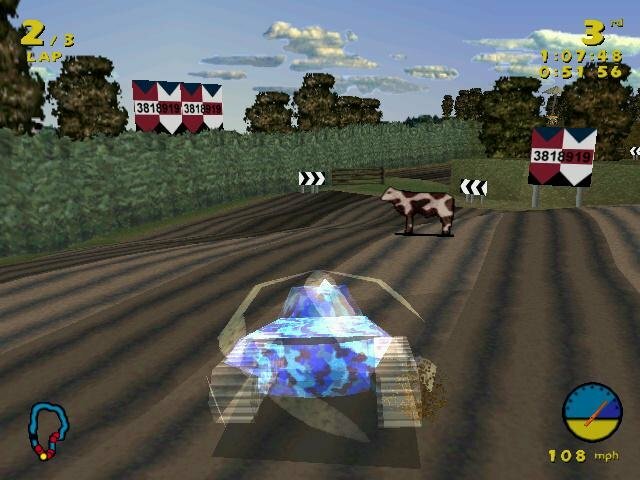 To make the game more challenging, you’re always pitted last and must race your way to the front of your opponents to qualify for the following race in Cup mode. 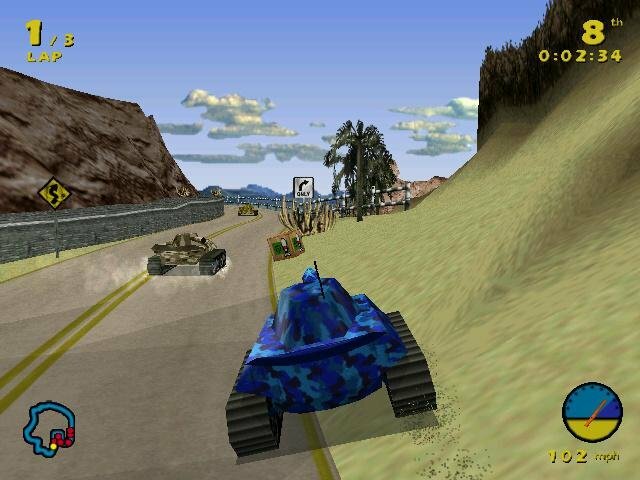 The low-poly graphics are in part due to this game being a PlayStation port, but that doesn’t even begin to excuse the atrocious level layout and tank handling. 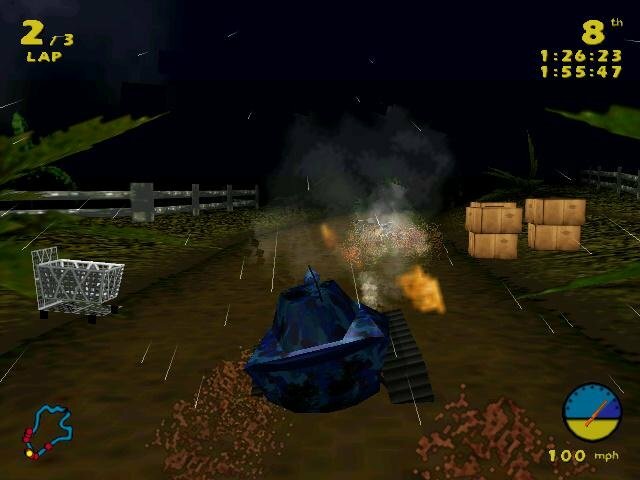 Each location you’ll visit has a different flair but you’ll find them essentially the same as you zig-zag through constricted spaces that allow too little room to corner but come with ample off-road terrain to send your thirty-ton war machine flying straight into a wall (or off into outer space if you find the right glitch). You get a limited array of vehicles that all look and drive pretty much alike. None are based on real-life counterparts and none are particularly different save for some statistical specifics (eg: faster tanks have lighter armor, heavier ones are harder to control, etc). Scratch that last sentence. 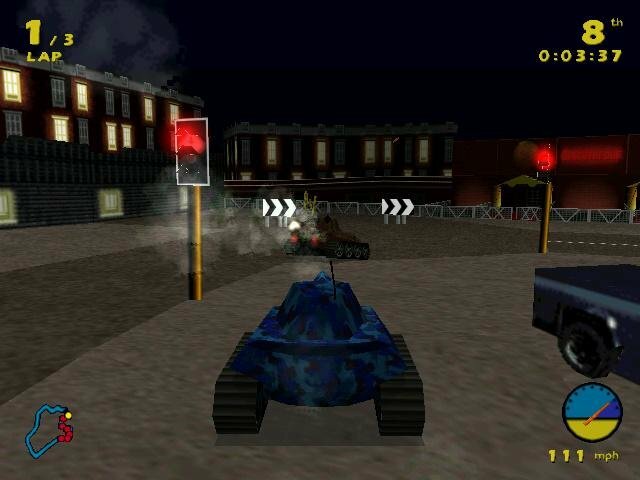 Each tank in this game handles like crap, especially when combined with the crazy track layout. Even though the game runs generally fine and isn’t prone to crashing on neither its native OS or a somewhat more modern XP, it’s ultimately the lack of content that brings it bottom down. The tracks are few and most are locked by default when you first start the game. All tanks are essentially the same. 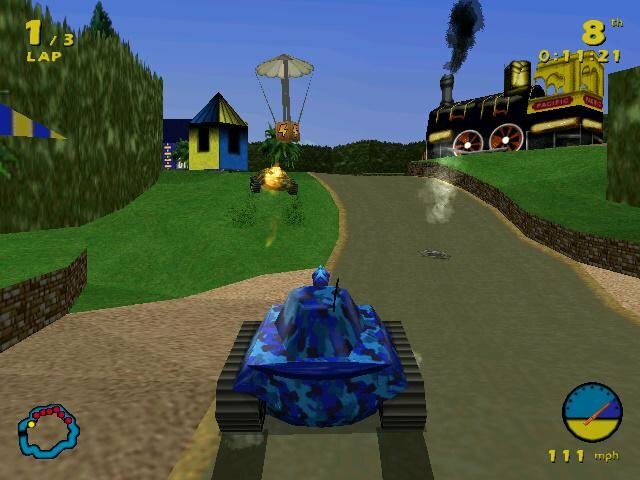 It’s only the addition of power-ups that lightens gameplay, giving such bonuses as a guided missile, temporary turbo speed or the ability to lay mines behind your opponents. 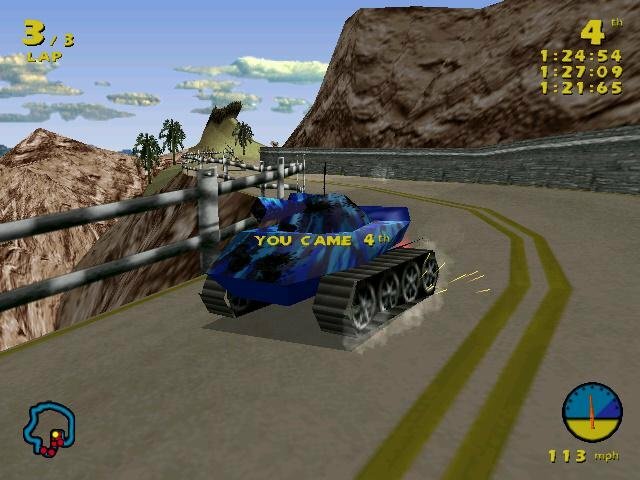 Taken as a whole, however, Tank Racer just isn’t worth it, even with its zany racing.